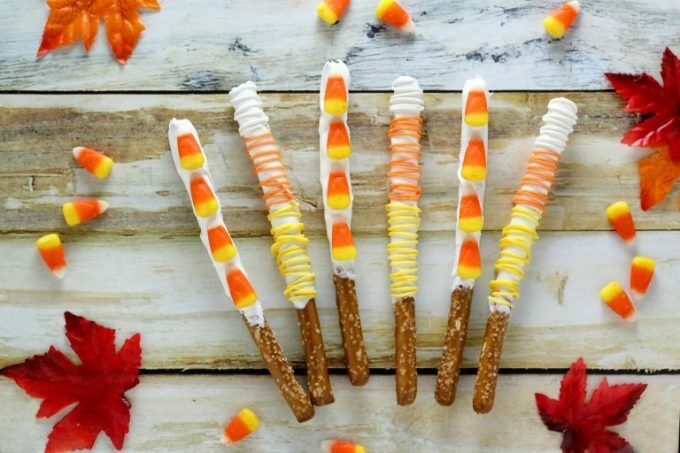 Want a fun fall treat that you can make in a hurry? 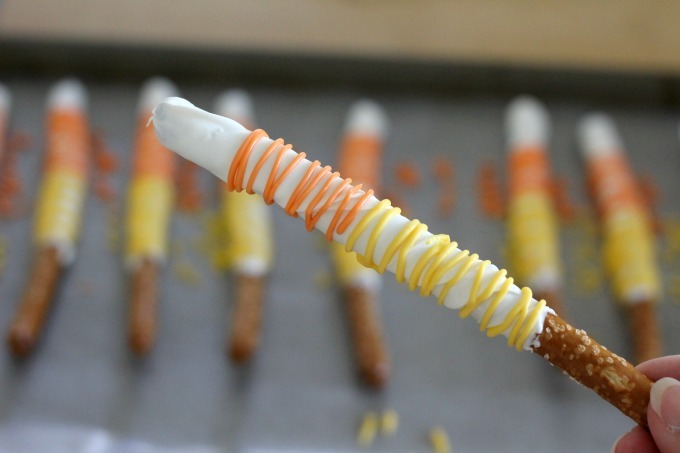 These Candy Corn Pretzels are not only delicious, they’re super easy to make. 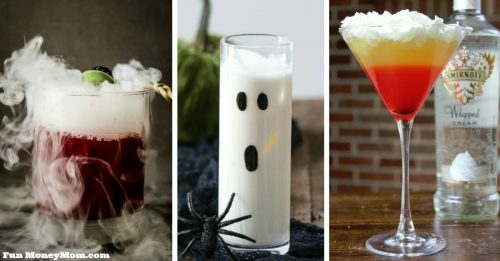 Serve them at your Halloween party, add them to a “Boo” Basket or turn them into a fun teacher gift. 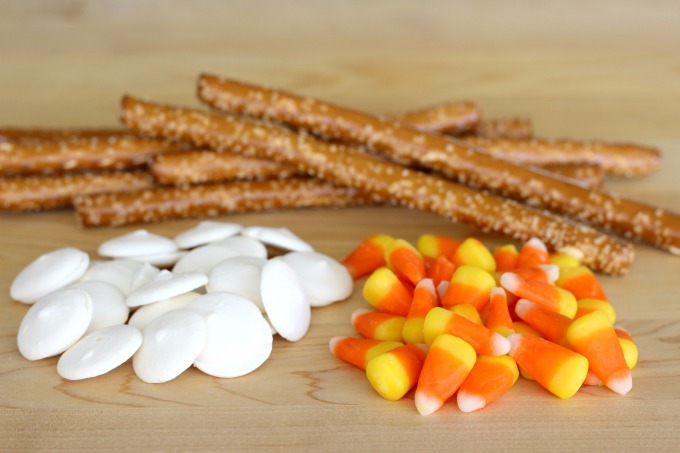 I had some big plans for this month…big candy corn plans. I bought my bags of candy corn back in September but I just ran out of time somehow. 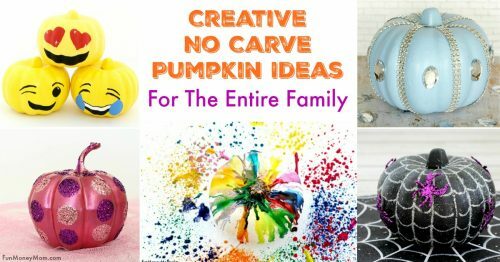 My bags of candy corn sat on my kitchen counter all month while I was busy making no-carve pumpkins and pumpkin parfait desserts. I refused to let October go by without making at least one candy corn treat so I put everything aside to make a batch of candy corn pretzels. At first I just had one idea in mind but in the end I ended up with three. 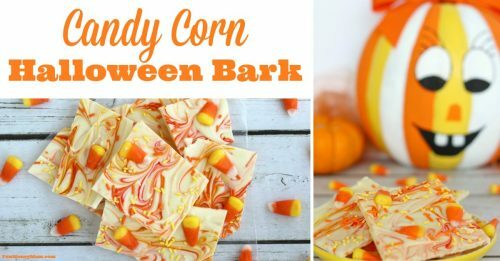 Okay, technically one of these treats doesn’t actually have candy corn but I used candy corn colors so that counts, right? 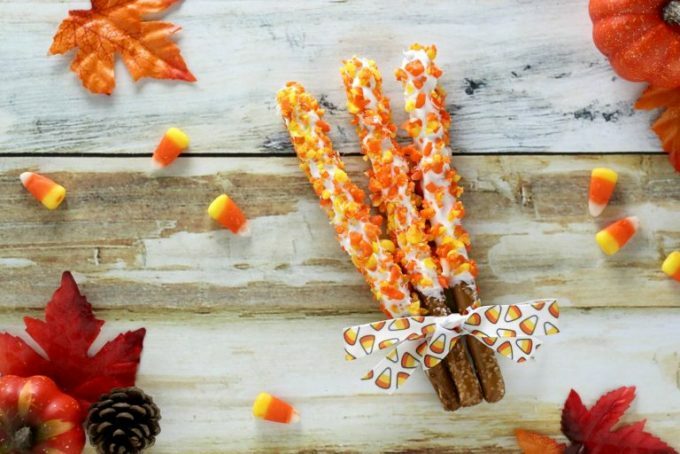 I love these candy corn pretzels because they’re perfect for Halloween parties, “You’ve been booed” baskets or even gifts for teachers, which is what we plan to do with ours. 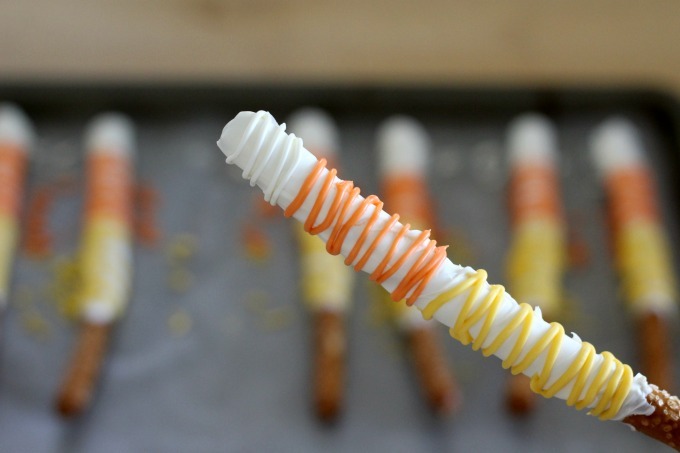 They’re easy to make and you only need a few ingredients: Pretzel sticks, candy corn and white candy melts (or you can substitute white chocolate). 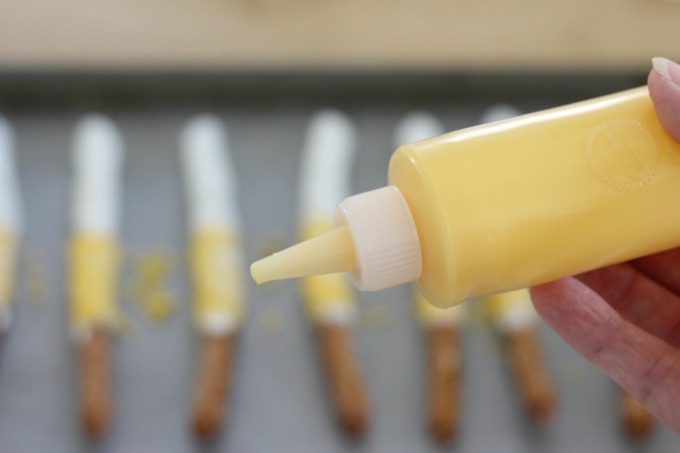 If you’re making the drizzled pretzels, you’ll also need orange and yellow candy melts. That’s it…pretty easy, right? Start by covering a cookie sheet with wax paper. 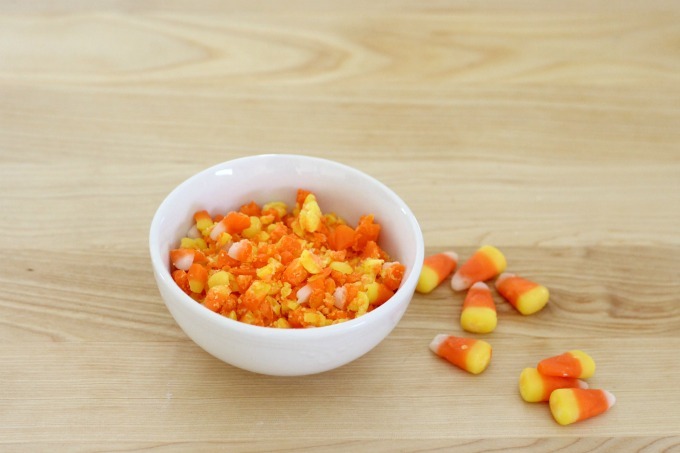 Next, put a couple handfuls of candy corn in a bag and place it in the freezer. You’ll need to beat the candy with the flat side of a tenderizer to make crumbles and I found it works better when they’re frozen first. Otherwise, since they’re a soft candy, they tend to just get flattened out. After about 1/2 hour in the freezer, they should be ready. After I took this picture, I broke the pieces down even more. I thought the bigger pieces might not stick to the chocolate as well and I was right. Next, melt your candy melts. I’ve found that one cup of candy melts covers about 16 pretzels. Microwave it for one minute, stir, then melt in 30 second increments until the candy is completely smooth. 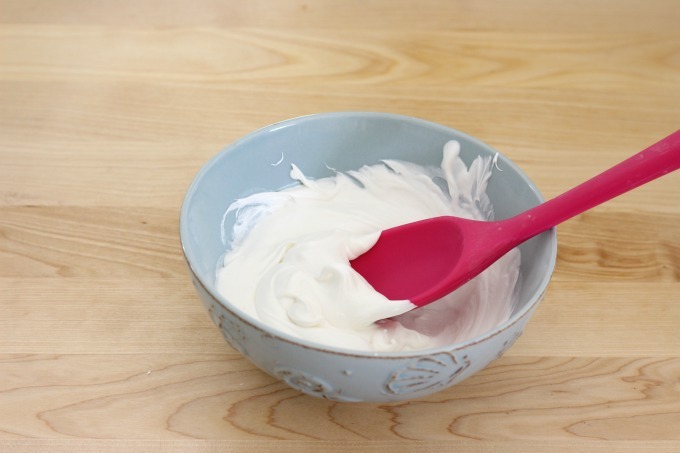 I add a little vegetable oil to make it even smoother. It doesn’t take much, about 1/8 tsp for a cup, and it’s completely optional. I just like that it gives the candy melts a smoother consistency. Next it’s time to dip your pretzels in the chocolate. You only want to cover them 1/2 to 2/3rds of the way down. There are plenty of ways you can do this but I use a tall, skinny glass to dip mine. I just tilt it to the side a little and it totally does the trick. I didn’t spend too much time getting it completely smooth since I’d be covering it with candy corn anyway. 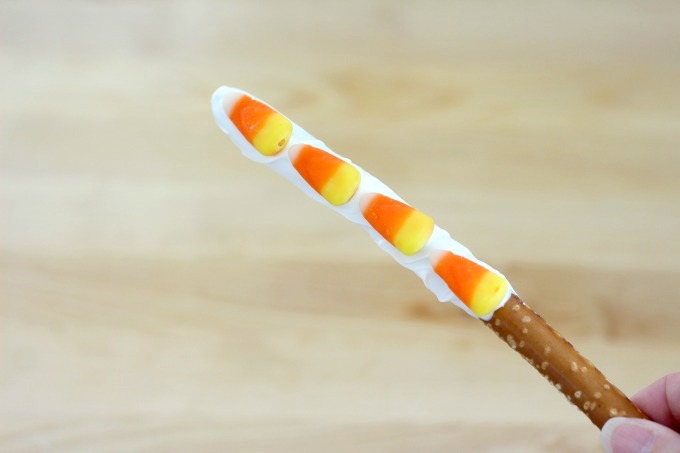 Sprinkle the candy corn pieces over the pretzel, pushing them down a little to be sure they stick to the chocolate. 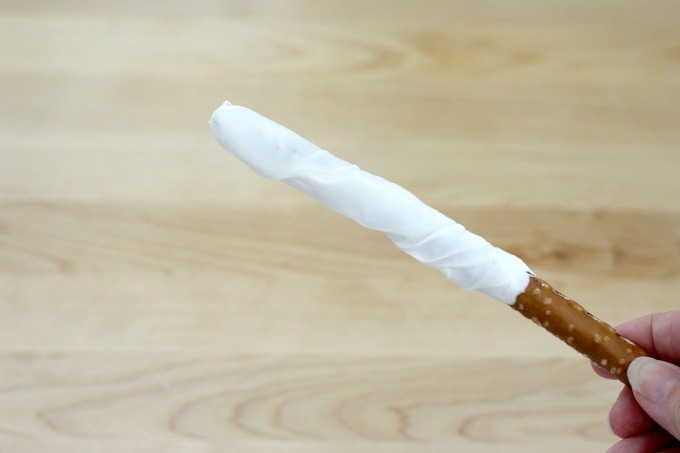 Place your pretzel on the cookie sheet and refrigerate until the chocolate hardens. 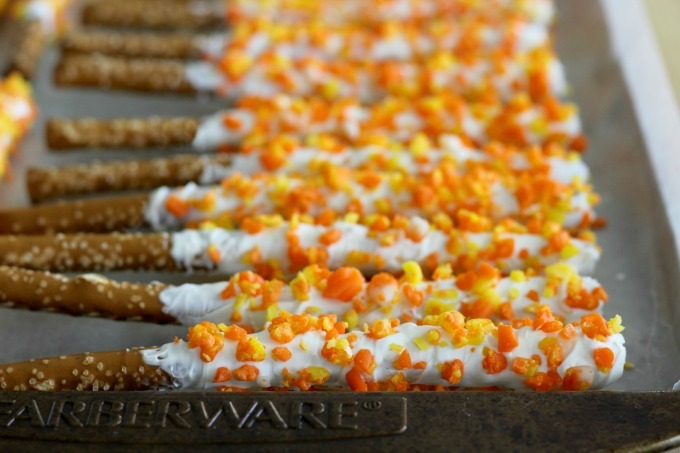 After about 1/2 hour, your candy corn pretzels should be good to go. 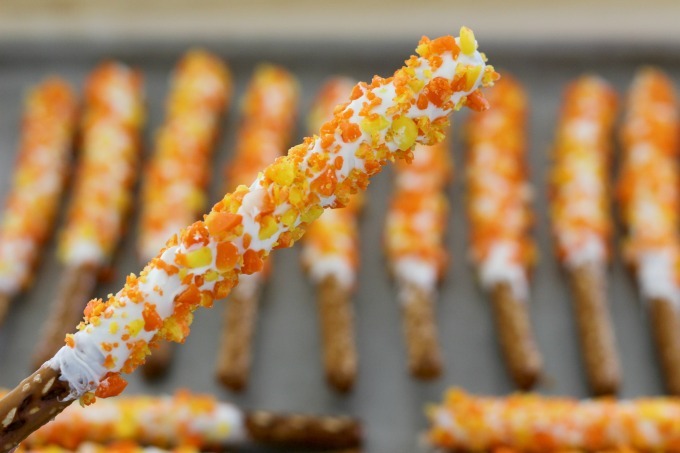 While my original plan was to just make just the candy corn crumble pretzels, I found that I had a little time on my hands while waiting for the candy corn to freeze. I decided to add whole candy corns to a chocolate covered pretzel. This was definitely the easiest to make of the three. I just followed the above steps with melting the chocolate and stuck the candy corn right on top. Since those were so easy to make, I still had some time on my hands. 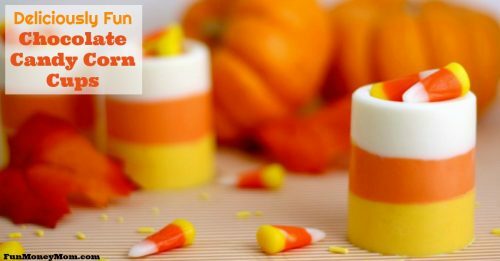 I pulled out my orange and yellow candy melts and got to work on my next simple creation. This one didn’t involve actual candy corn but it does feature candy corn colors. I started by melting yellow candy melts and filling a plastic squeeze bottle. 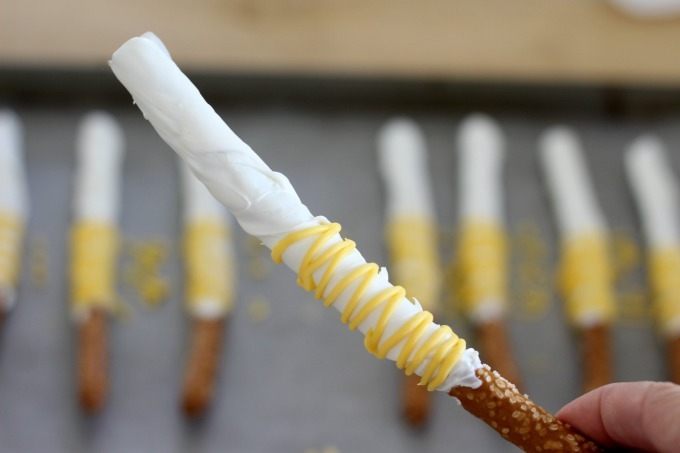 Next I drizzled yellow along the bottom of the pretzel. I did the same thing with orange candy melts. After finishing it off with white, I put these pretzel in the refrigerator to harden. I thought these turned out cute for spur of the moment treats. The crumbled candy corn pretzels were by far my favorite though. Do you love candy corn as much as I do? 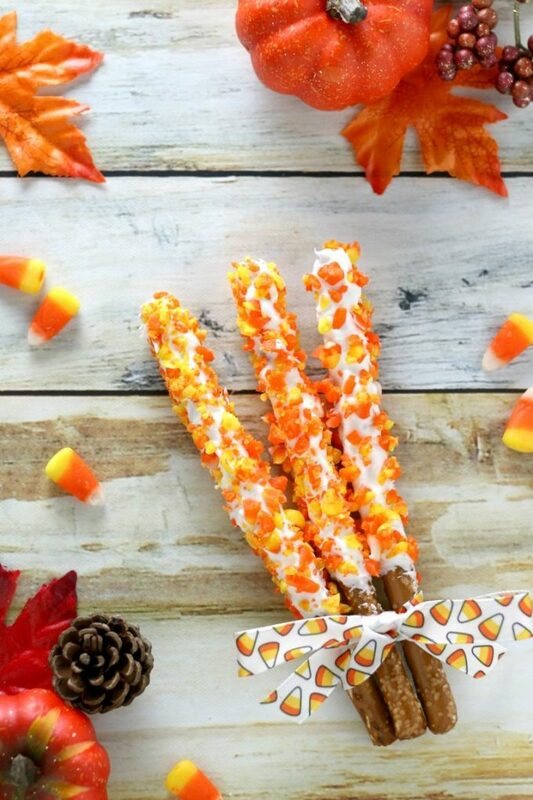 What candy corn treats have you made this year?